A coproduction of the Bauhaus Dessau Foundation with the Institut de Cultura "Mercat de les Flores" (Barcelona), the Dessau Ballett and the Hochschule Anhalt (FH), Department of media design. The dance and video performance Occupation was inspired by the essay "The Conquest of the Body" by Paul Virilio. 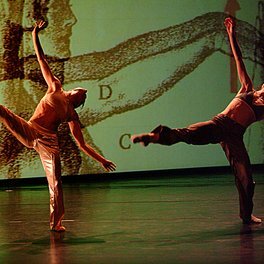 His reflections on the human being as optimiser and designer of him- and herself provided the basis of dance, video projections and music. What evolved was a metaphorical discovery and "conquest" of ambivalent images of the human body between desire, pleasure, and fear. After the world premiere in Dessau, there were further successful performances in Barcelona in the Institut de Cultura "Mercat de les Flors".